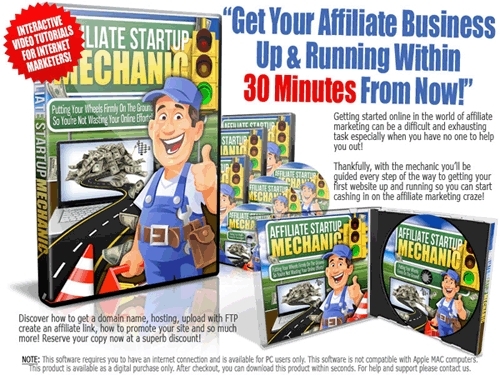 Affiliate Startup Mechanic Comes with Master Resale Rights! Stop Spinning Your Wheels Endlessly Trying The Figure Out How To Get Your Affiliate Business Moving! ...Get Your Hands On The Easiest 'Do This' 'Do That' Training Videos That'll Finally Get You Where You Need To Be! How to research keywords and select the ones that will allow you to drive waves of cash-in-hand, eager buyers to any web page! How to buy a domain name that will grab prospects attention and entice them to visit your site! How to get hosting for a price that wont end up sucking up all your profits! How to upload/FTP a website even if you have ZERO technical knowledge! What affiliate marketing really is and how you can lay the foundation you need to become one of the Internets most successful affiliate marketers! How to use CPA Networks to really send your affiliate marketing profits soaring! How to promote your site/affiliate link as well as or even better than todays most successful affiliate marketers! How to begin using the Google Adwords keyword tool like an experienced pro! The best criteria to use when researching keywords so that you get the most effective keywords for your business! How to research the competition the RIGHT way and then take what youve learned to beat them at their own game! How to save money when you buy hosting! How to set your domain servers for maximum effectiveness! Plus, what's an ftp client and how to easily upload your website using one even if youve never done it before! Video #5: What is Affiliate Marketing? How to use Amazon and ClickBank to generate massive affiliate profits! How to optimize and best use your affiliate links! Which CPA offers are the best! Which CPA Networks are the best! How to stay up-to-date on all the offers and networks from one convenient place! How to add backlinks so that you can get those much desired high search engine rankings! How to use forum marketing to increase your profits! How to use article marketing to increase your traffic and your profits!